Pilates for beginners, and any of you out there who are questioning exactly why and where you should position your body for certain exercises should read on. Many of the Pilates exercises can be stressful on the body, if you do not first learn how to do Pilates for the most efficient and safest movements. Pilates beginner exercises are a great way to learn the fundamentals and find out how to position yourself for the best workout possible. When starting Pilates for beginners it is important to find neutral spine, which is keeping the natural curvature of the spine with the abs engaged to protect it. Neutral, pertaining to the natural curvature of our spine, is important to focus on during your movements. This is how the spine works most efficiently and how we want to move all day long whether we are standing, sitting, or moving. To find your neutral spine begin by lying with your knees bent. Focus on the tailbone first, let it sink into the mat like an anchor drawing your lower or lumbar spine into a natural arch. Next, move to the thoracic or mid back area and draw your mid ribcage into the mat without flattening the lumbar area. The shoulders should be heavy and your chin should be drawn down about a fist length from the chest so you feel the back of the neck lengthen. The neutral spine position for Pilates movements will help you to train your muscles to hold your spine upright and lessen your risk for injuries while exercising or just doing daily activities. 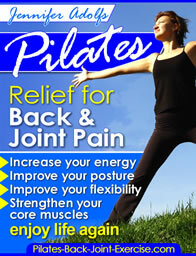 Find out more about Pilates for Beginners in my DVD for Healthy Back and Joints here. Many Pilates for beginners movements are done ultimately with the head floating using the abdominal muscles. If the head is not positioned correctly the muscles in the neck and shoulders could become tight and strained. Our heads weigh up to 12 pounds! If the neck and shoulders have to support all this weight alone you can bet they will be tired and strained by the end of the day! When lifting the head it should feel like it’s floating, if the abdominal muscles are properly supporting it. Your chin should be about a fist length from your chest, shoulders are pulled down with lots of space between them and your ears. Keep your shoulders wide and chest open. The head should be properly supported by the abdominal muscles. This happens by folding just under the chest where you feel the abdominal muscles contract and flatten or widen. Once you get this feeling you can then start some Pilates for beginner movements such as: the single leg stretch, the hundreds, and the double leg stretch. See all my exercise of the month moves from this page. doing Pilates beginner exercises prone, or lying face down. Keeping the hips and pubic bone in a flat triangle while lying on your stomach helps the deeper abdominal muscles work to protect the spine while strengthening the muscles of the lower back. While lying on your stomach with legs extended and head resting on forearms overhead draw your belly button up and in, imagine you are squeezing a diamond in your belly button and don't want it to fall out. See the lower back leg extension exercise to the left. It works the back and abdominals together as they brace the spine to protect and strengthen it. When you learn how to Pilates this way you will feel your pubic bone press into the mat and the pelvis hollow out. This means your abdominal muscles are working to stabilize this area for some of the prone exercises like the leg/hip extension. hand on your bottom arm folded over, then lengthen yourself out along the mat with your legs long and piked slightly forward for better balance. Give your top hip/leg a little push so it lengthens away and you feel your abs pull in as your waist lifts up and lengthens off the mat. This way you have space between your waist and the mat keeping the hips and shoulders lined up over each other. To learn more about these Pilates for Beginners exercises, as well as a progressive sequence through all the levels check out the new Pilates ebook. You will have access to over 40 different pictures and detailed descriptions along with cautions and modifications on certain exercises. This book is available at a fraction of the cost of an individual Pilates session and the information contained is what I have spent years developing and using on my own clients.